My friend Renee had experienced weddings of all three daughters. The addition of sons-in-law and lots of grandchildren happened in what seemed like no time at all. I was newer at all this so I was picking her brain. She called the marriages and new relationships “expansive”. Renee is one of those people that when she speaks you want to scoop up every word. She doesn’t just toss words out like some of us do. Since she didn’t offer an explanation for expansive I knew I’d find out for myself. We prayed for our kids’ future spouses their entire lives. It seems like such a far off prayer, and then before you know it your son or daughter finds just the right mate. It’s magic. An incredible answer to our hopes for them. As our family began to expand, I saw in myself an attitude of wanting the new people in the family to like me. I guess I wasn’t completely comfortable with my in-law status—sometimes I felt like I was in middle school with the insecurities. One way to show love and bring folks together is to feed them. I’ve always believed that sharing a meal around the table is the best way to really know people and bond with them. As soon as you pull up a chair to the table, you’re all on common ground. No one is better than the other one and the table joins you together with an invisible cord that causes everyone to breathe easy and be their authentic selves. At least that’s the way I see it. It was with these thoughts in mind that I planned our Sunday lunch. It would be one of the first times our new daughter-in-law Mary would join us after church for lunch. I baked bread. Artisan bread is so easy to make; it just takes a little planning ahead. Homemade bread always seems special and that’s what I wanted this meal to be. The bread stood out so much in the meal that I honestly don’t remember the other items we had! You’ll soon see why. I took the loaves from the oven as everyone was seated. There’s nothing like that aroma of homemade bread. The butter was on the table, softened for easy spreading. Ahhhhh….. The slicing began and suddenly the chatter became silence. I gazed toward the table from my post at the counter—my eyes connected with a look of shock on Mary’s face. She had just bitten into the bread and was pulling an object from her piece of bread! Time stood still. A band-aid! Oh no! What? How? Words popped out of my mouth with no thought whatsoever. “Mary, welcome to the family. You’ve now passed your initiation to become a real Freshwater!” We all laughed and even proceeded to eat the bread, disposing of the tainted piece. Mary reminded me that I’d told them about cutting my finger while preparing vegetables the day before. I had wondered what happened to that band-aid! This wasn’t really Mary’s initiation into the family. It was my initiation into being real. Surely nothing could be more embarrassing than what I’d experienced with the bread. I remembered the word expansive from Renee. In families we are blessedly stuck with each other. As we grow we expand in understanding and love as we include more people and their unique attributes from which to learn. We grow as individuals as we tangibly move toward each other. Even after that fateful Sunday lunch, breaking bread around the table is still my favorite! 1. In a large plastic resealable container, mix yeast and salt into 3 cups very warm (about 100 degrees) water. Using a large spoon, stir in flour, mixing until mixture is uniformly moist with no dry patches. Do not knead. Dough will be wet and loose enough to conform to shape of plastic container. Cover, but not with an airtight lid. 2. Let dough rise at room temperature, until dough begins to flatten on top or collapse, at least 2 hours and up to 5 hours. (At this point, dough can be refrigerated up to 2 weeks; refrigerated dough is easier to work with than room-temperature dough. It’s best that first-time bakers refrigerate dough overnight or at least 3 hours. 3. When ready to bake, sprinkle cornmeal on a pizza peel. I use parchment paper on a round stone with cornmeal sprinkled on it. Place a broiler pan on bottom rack of oven. Place baking stone on middle rack and preheat oven to 450 degrees, preheating baking stone for at least 20 minutes. 4. Sprinkle a little flour on dough and on your hands. Pull dough up and, using a serrated knife, cut off a grapefruit-size piece (about 1 pound). Working for 30 to 60 seconds (and adding flour as needed to prevent dough from sticking to hands; most dusting flour will fall off, it’s not intended to be incorporated into dough), turn dough in hands, gently stretching surface of dough, rotating ball a quarter-turn as you go, creating a rounded top and a bunched bottom. 5. Place shaped dough on prepared pizza peel and let rest, uncovered, for 40 minutes. Repeat with remaining dough or refrigerate it in lidded container. (Even one day’s storage improves flavor and texture of bread. Dough can also be frozen in 1-pound portions in airtight containers and defrosted overnight in refrigerator prior to baking day.) Dust dough with flour. 6. Using a serrated knife, slash top of dough in three parallel, 1/4-inch deep cuts (or in a tic-tac-toe pattern). Place dough onto preheated baking stone. Pour 1 cup or more hot tap water into broiler pan and quickly close oven door to trap steam. Bake until crust is well-browned and firm to the touch, about 30 minutes. Remove from oven to a wire rack and cool completely. 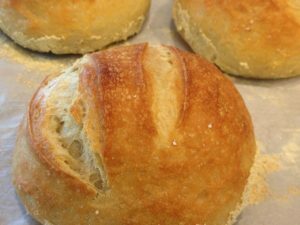 There are many Artisan Bread recipes online. I just thought it would be fun to include my version here. Enjoy! I have loved all of your post! Each of them have touched my heart! Thank you for sharing them. I love you sweet friend! Thank you so much for your comments Eva! Much love to you! I was telling Jim this story; and he said, “she needs to get better organized”. 😂. I thought you’d like that. one of the most hilarious moments ever!